The 37th International Christian Artist Seminar: Inspiring And A Renewal – Please pass on this information. from July 29 – August 2: It’s a great and beautiful location. You are invited. Till may 30: … 15% discount for early booking. Are you creative? Are you interested in Music, Visual Arts, Dance, Theatre, or any other form of art? Are you yearning to learn? Are you keen on meeting other people with the same vision? Are you open and willing to share? Above all, are you looking for inspiration and renewal? If so, then the annual Christian Artists Seminar is the place to be. You are warmly invited to join us. Art lovers, artists, teachers and speakers gather from all over Europe for a very inspiring week in beautiful surroundings. At the beginning of the programme are stimulating and engaging plenary meetings in which speakers share about the latest developments where art meets faith with an emphasis on real artists making a living doing real work in the real world. 1½ plenum days for these are followed by 2 days of workshops with talented professionals (you can choose out of 70 different workshops). In the evenings you will attend 4 concerts/performances, watching and listening to more than 35 artists. Be ready to open your mind and be inspired! Be ready to improve technically. Be readyto grow spiritually. Be ready to develop your vision for life as an artist! There are possibilities for evaluation of your talent. You will receive a certificate based on the European Credit Point system. There is great interest of top-artists, teachers and speakers to contribute to the upcoming Christian Artists Seminar (July 29 – August 2). There will be great contributions too of young top-talents. Do not miss this unique event! 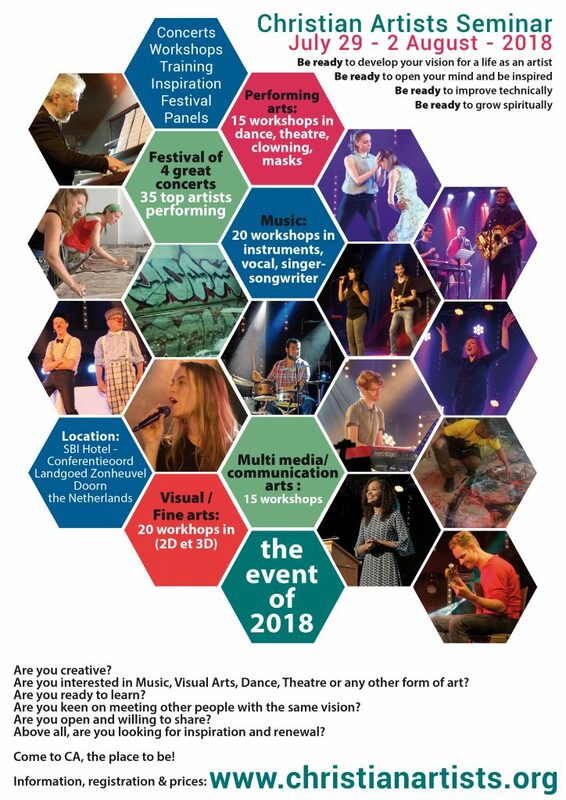 Confirmed artists/teachers/speakers: Marijke Bolt(sculpture,NL), Esther Hannah Burger- Hucks (piano, Germany), Didi Companjen(worship,NL), Hannah Clair (vocal class, France), Didi Companjen (worship, NL), Noemie Daval ( fine arts, France), Jan Willem van Delft (piano, NL), Gerdien van Delft-Rebel ( fine arts, NL), Wiebe van Dingen (fine arts, NL), Paul Donders(speaker, NL), Klaus Andre Eickhoff (singer-songwriter, Germany), Paul van der Feen(musician, Nl), Jill Ford (theatre, Uk), Torsten Harder (musician, Germany), Werner Hucks (musician, Germany), Ruth Hughes(dance, Uk), Richard Hughes(film, Uk), Marta Jakobovits(clay-3D, Romania),Birgit Juch (dance, Nl), Tobias Kerkhoven (E-guitar machinist, Nl), Natael Kerkhoven (MC and singer, Nl), Chesron Ledes (CA-gospel choir, NL), Dr.Lasma Dobele Licite(lector, Latvia), Teddy Liho (presentation skills, Bulgaria), Aron de Lijster (basguitar, Nl), Arend Maatkamp(graffitti art, computerwork, Nl), Maria Markesini(singer, Greece), Corentin Martinez(drums, France), Talitha Nawijn (vocal coach, Nl), Thomas Nöttling (piano, Austria), Jeanine Noyes (singer-songwriter, Canada), Nikos Papadogiorgos(composer, Greece), Angelique Petit (mime, France), Arthur Pirenne(clowning, Nl),Jan Willem Plutschouw(clown, Nl), Dr.Evert van de Poll (speaker, France), Reijer(singer-songwriter, NL), Rivelino Rigters (urban music, Nl), Leen & Ria La Rivière (speakers, Nl), Jonathan Romppel(keyboards, Germany-USA), Prof.Ward Roofthooft (lector, Belgium), Alexandra Smith (speaker and storytelling, Nl), Peter S.Smith (drawing, Uk), Thea Soltau (performing arts, acting, Uk), Vicky Stanley (theatre, UK), Dr.Geoffrey Stevenson(lector communication, UK), Judith Stevenson(writing, UK), Renske van Twillert(printmaking, Nl), Damaris Veenman-Verduijn ( dance, Spain), Jenny Verplanke(painting, Belgium), Heike Wetzel(flute, Germany), Paul Yates (photography, Germany), Elly Zuiderveld (singer-coach, Nl)… more to follow Seminar language is English, all plenums will be translated into FRENCH and GERMAN. Office: Christian Artists, postbox 81065, 3009 GB Rotterdam, the Netherlands, tel.0031 10 4212592. Ask your questions by e-mail: info@christianartists.org. Costs: A: Seminar Fee (will cover all concerts, all workshops, programme book, talent-evaluation, etc.). The seminar fee is lowest until the end of May, Full price after 1st June. There will be discount rates for students and for participants from eastern and southern Europe; PLUS B: Costs of stay in a 2-persons bedroom, taking all meals in the conference-center For all details go to www.christianartists.org. Testimonials:Thanks to CA I got a lot of new work and performances around Europe and Africa, Arthur Pirenne, NL. CA opened a new world for me. I cried at my first CA, how beautiful and inspiring it was, Elly Zuiderveld, Nl. What struck me was the combination of hard and good work during the day and amazing performances during the evening, Ward Roofthooft, Belgium. It is so refreshing to be at CA, Marta Jakobovits, Romania. All people at CA enrich my horizon, and I benefit from that the whole year, Miriam Hofmann, Germany. Great friendships come from CA, such important contributions to my own life, Peter Smith, UK. Amazing collaborations helping me in my art form, Anlo Piquet, France. It’s coming home! Together gloryfying God, Didi Companjen, NL. It has so much broadened my mind and made friends for life, Jean Pierre Rudolph, France. The creative networking that takes place is invaluable, Jill Ford, UK. In one word, CA has meant “inspiration” – from a reawakening of creativity, a renewal of vision, a sense of community and networking, Dale Chappell, Portugal. We share our basic Christian faith and this makes it possible to be open and transparent: we are family. Every time after the conference I went back home inspired and with new ideas, plans, refilled with energy and love for my work, Heike Wetzel, Germany. I can even say it’s the place where you have to be yourself if you want to take the most of it all and make an impact on your daily life once back home, Claire Kowalcsyk, France. Christian Artists is like heaven for me once a year, a place where I can feel at home, where I am not a stranger, where I feel welcomed, loved and understood. I can do, see and hear wonderful things, Yoshiko Romppel, Germany. To discover doing my (crafts)work not only by head and hand but more and more also by heart, and the possibility to recognize and share these things feels like a warm bath, Corine Kraak, NL.